Back in 1926, Le Corbusier stated in his manifesto ”Five Points Towards a new Architecture” that the green space that a building in the city ”eats” should be re-established on the roof as a compensation. Him at the time mostly having his thoughts on a space that would represent a more usual house-garden, for inhabitants use of spending leisure time under the sun, and compensating to all the concrete that would be one of the most important materials in modernist architecture. 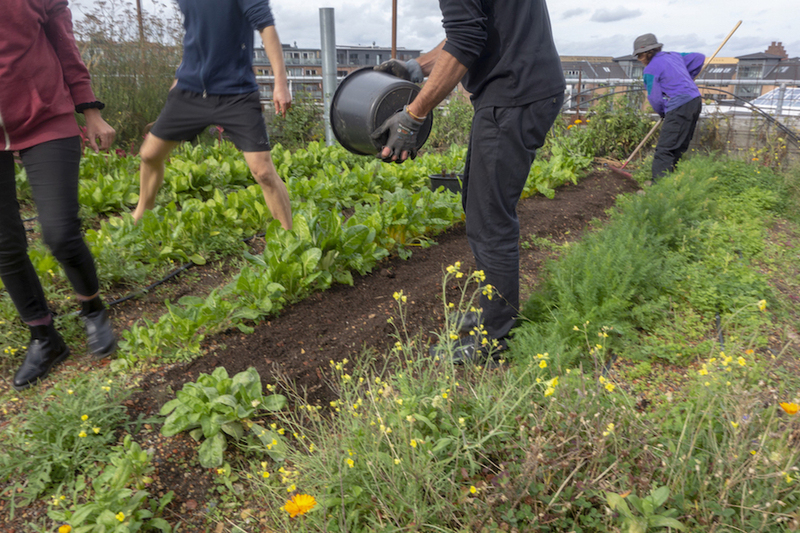 Surely though, rooftops are one of the spaces in the city that we could consider for growing edibles, as we see an expanding distance from farm (to supermarket) to table. 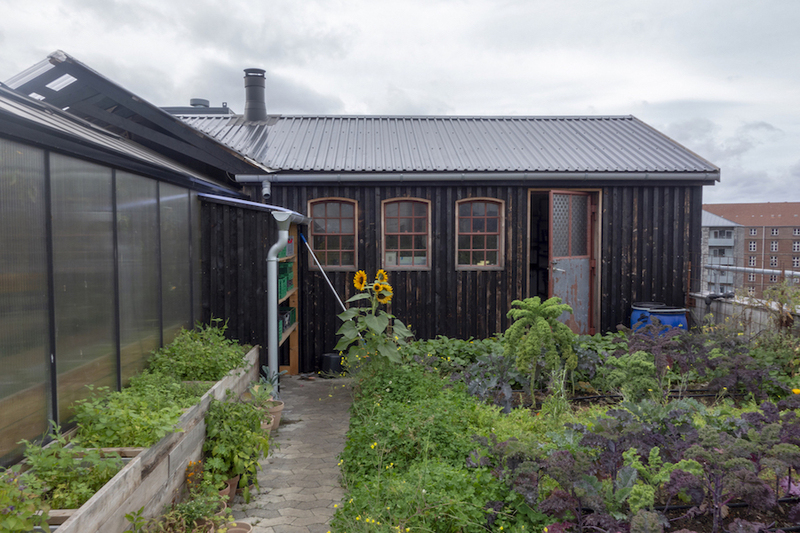 The rooftop farm ØsterGRO is located in the outer part of Østerbro in Copenhagen, about a 20 minutes bike ride from the centre in a recently renovated building where the three indoor stories are used as office space. 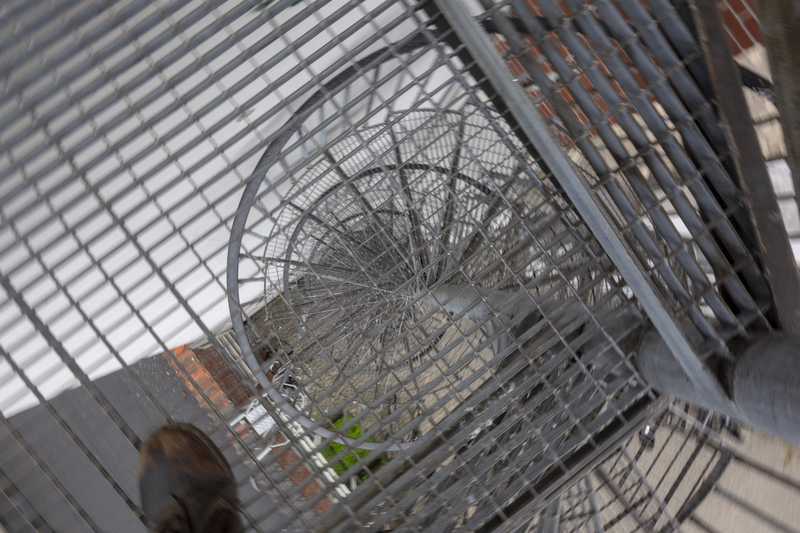 Although the rooftop is not more than four stories up, the exterior spiral staircase sets out a bit of discomfort as I ascend. 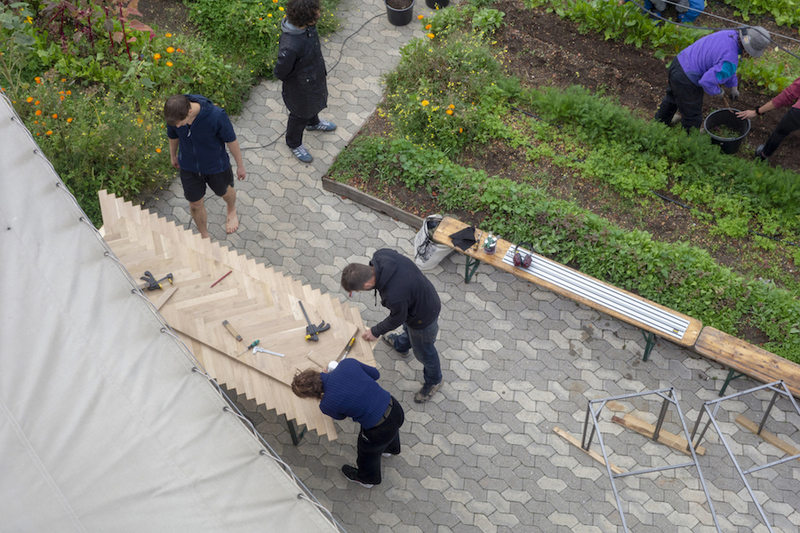 When I arrive at the rooftop, some four stories up, I’m welcomed by Kristian who one of the founders, who is building a table together with one of the volunteers. Even though it is a grey, cold, September Wednesday, I observe at least five persons working in these gardens right away. The walkway between the leading across the roof has on each sides cradles of soil where flowers, cabbage, tomatoes grow among wild weeds and grass. 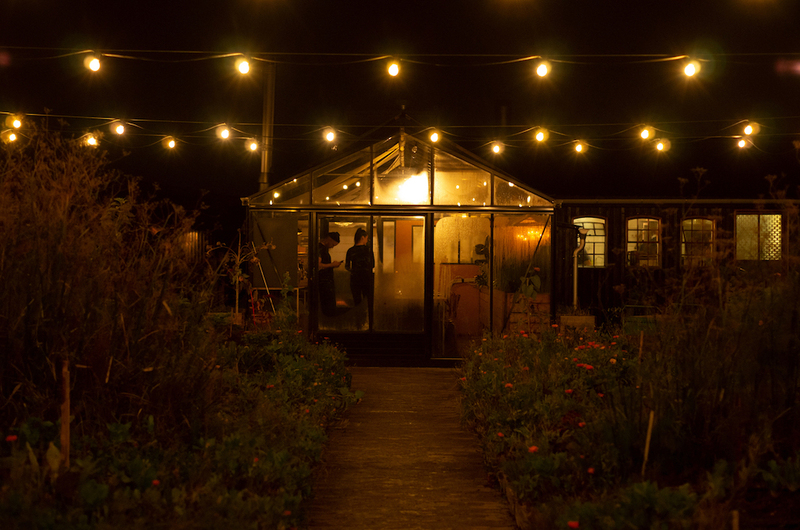 At the other end, a greenhouse extending from a small wooden house portraits live silhouettes of people sitting down seen through the translucent walls. The doors are partially open and I’m invited inside by a smiling person already inside. The rich smell of steamy grilled cheese, tomato along with pasta is already filling the room, and next moment, lasagna is served. The rest of the long table gets fully seated in just a moment’s notice. Lunch is served, one vegetarian lasagna, and one with meat. 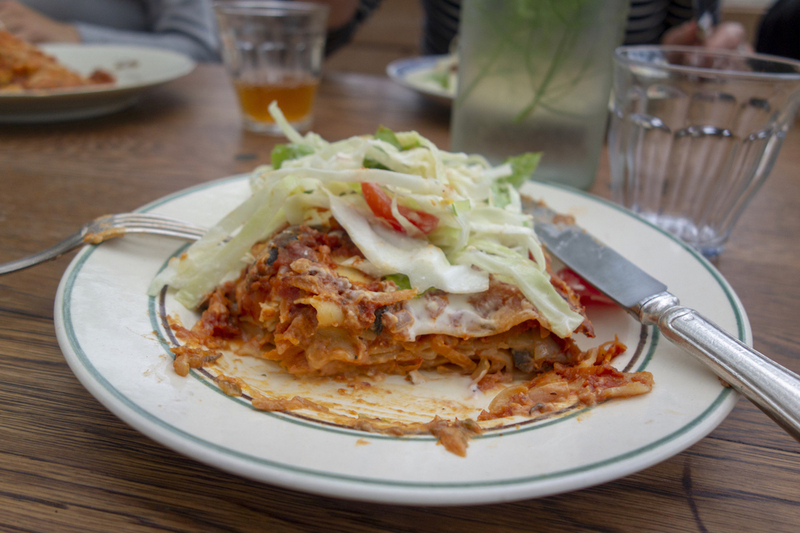 At the long community table, while passing the plates of lasagna around, I take the chance to talk to the people sitting around me. I happen to be seated next to one of the founders, Livia. She arrived just minutes after we started eating. Livia tells that the building on which ØsterGRO is located, a concrete structure standing among office buildings, apartment blocks and construction sites, was once functioning as an auction house for used cars. Naturally, the roof was constructed for carrying the vast weight loads of cars, and there is a big elevator for transporting them to the different stories. Therefore, to bring a couple of tonnes of soil and to place it safely there is not too big a deal. Besides, the owner of the building had specifically expressed his will to host a tenant with a vision of doing something good for nature and sustainability to the municipality, so acquiring the space was not difficult with a farming project of this kind. Along with this, the municipality and a fund for organic farming helped starting up the project in 2014. 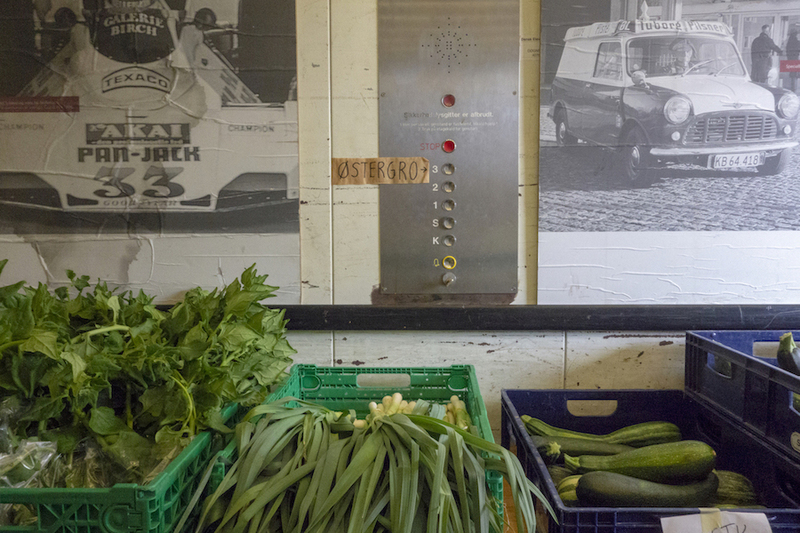 One of the main purposes and driving forces of ØsterGRO is the word ”sustainability”. From being a ”fluffy” word, the goal is to turn it into in to something tangible. ØsterGRO is facilitating space to come and see and take part in instead of just consuming things labeled as ”sustainable”. Understanding concepts such as circularity through working with seed to plant and later having the organic waste turned into compost to be used as soil for the coming plants. All on top of a rooftop in the city. It took a team of about 100 neighbours, volunteers and the founders just a weekend to fill the lands of the roof with soil. This laid the foundation for the community supported agricultural practice (CSA) that is running today. We finish our meal and we bring our plates back to the washing machine. The kitchen is actually quite big, and the space is very appealing, as being in a very different place than in the city. Livia states that is an unrealistic utopia to have a city of Copenhagen self sustained with vegetables, even if utilising all of the rooftop space there is, this would not be enough. The main goal is that of planting seeds of awareness in those who come here, and especially through making neighbours or their friends curious of what is going on in this place, or those ending up here by being brought with their family or friends for a wedding party or for company events. 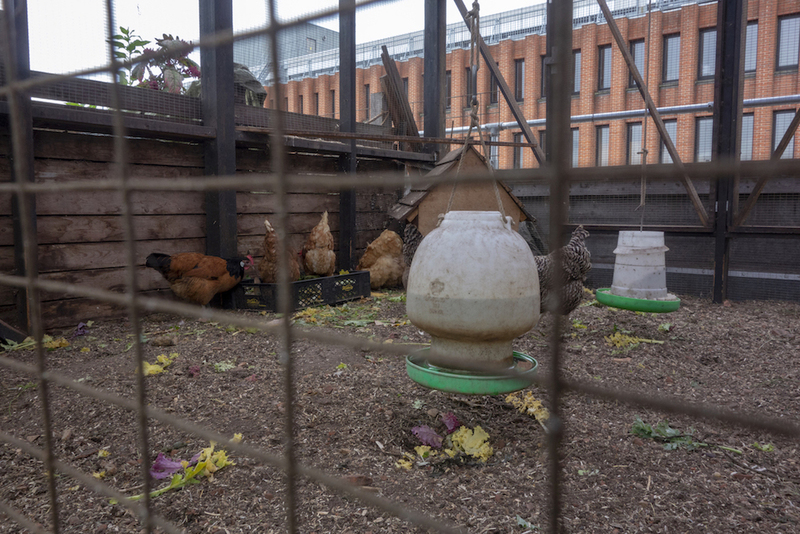 ”We often experience that some people come up here, giving the impression of being dragged along, thinking that concepts organic and sustainability are some leftist snobbery that city people make up. But after spending some time to get to know what we do, and for them involve in the act of farming, they gain a whole new perspective of what it actually takes to grow crops, and to learn of the processes around and behind it, turning their minds, at least a little in a better direction.” Basically, the first hand experience makes ecosystems seem less foreign. The only reason that ØsterGRO has grown to what it is today, is because of the collective effort of many individuals who has been a part of it along the way. Even though it might look good on paper, The only reason that ØsterGRO has grown to what it is today, is because of the collective effort of many individuals who has been a part of it along the way, Livia modestly stresses, as she neither believes, nor wants to be portrayed as the ”strong, young, female entrepreneur who did it single handedly;” something she encounters when being spoken about by local journalists. What constitutes ØsterGRO today mainly consists of three major instances. The volunteering members, the group of people running the rooftop farm (including Kristian and Livia) and the farmers who provide vegetables for the volunteering members and the restaurant. 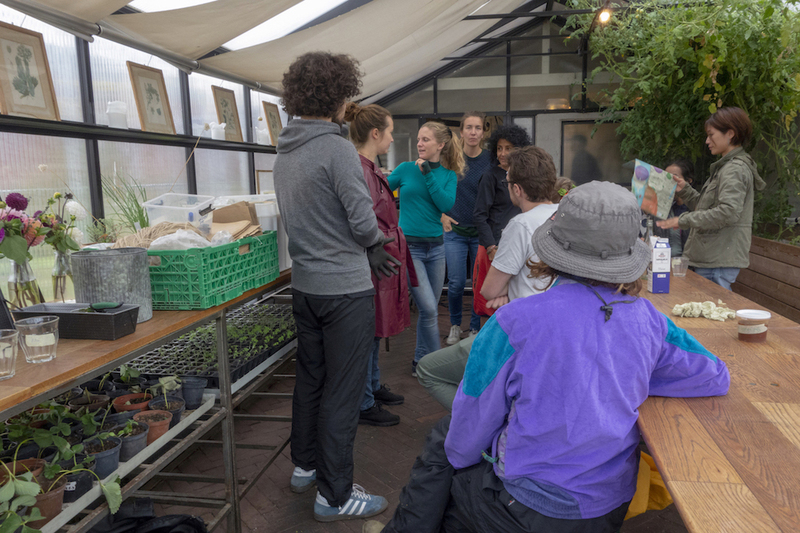 On Wednesdays, the volunteers gather for working in the soil, and this is the time where they also have a chance to collect a bag of vegetables from organic farms located around Copenhagen. ØsterGRO also keeps bees for pollination and producing honey, has a couple of hens as well as they collect seeds from their own vegetables. 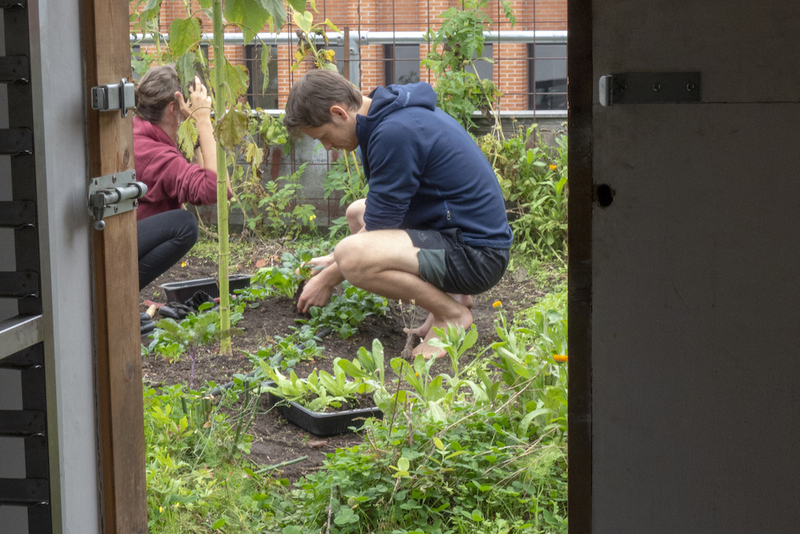 It also happens that people come by with seeds from their own gardens, and usually they have something more uncommon growing, which they want to promote. But apart from that, they have been given seeds from all sorts of places, ”Also from Japan” says Livia. This way they have a big diversity, and every year around Christmas, they sell some of the seeds at their own seasonal market. The honey produced, and the vegetables that ØsterGRO helps other farmers distribute is strictly shared among the volunteers. The main house on top of the roof is constructed by the team themselves a few years ago, and the facade is in home-charred larch, a preservation method not commonly seen in Scandinavia, but very effective for preserving and impregnating the wood. A few years ago, a team of chefs was renting the space and was serving food with the story that was focusing around ”I” and with a heroic tone. Although popular and of high quality, this way of projecting their story didn’t fit in with ØsterGRO’s ideals, and eventually they had to end the contract for this reason. Today the team consists of a group of professional chefs joined to the ØsterGRO project. The main purpose of the restaurant is to tell the story of ØsterGRO as well as gathering people in an environment that might be foreign to them. As it seats two communal tables four to five nights a week. 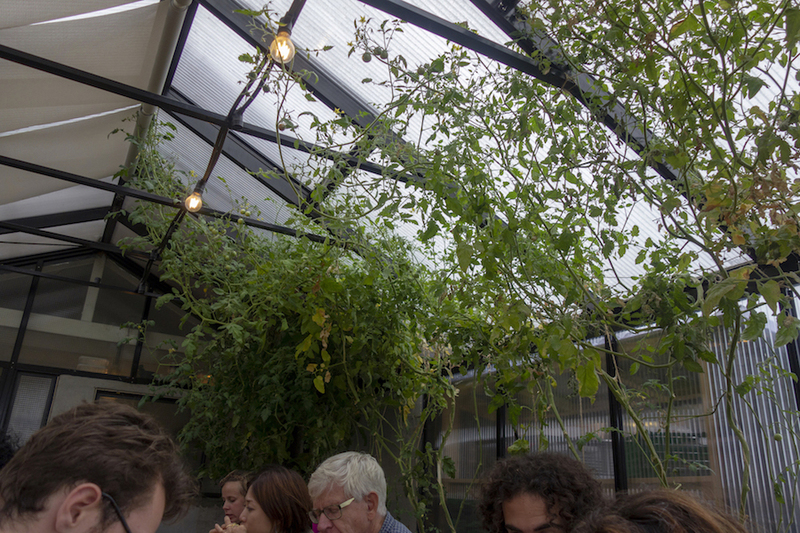 Of course, the vegetables for all these meals are not from the relatively small rooftop, which also is an important point for the restaurant. There is no way that a small farm like this could produce those amounts, and that’s an important point, to not only come closer to what’s growing as a guest, but also to understand what it takes to produce what we will have on our plates in the end. The ØsterGRO project reaches much further outside its rooftop site. Neighbours, visitors from far and near, and those who end up there by chance all take part in what is becoming a global movement. One with a very local impact and one of the few that is actively working with the ideas of modernist architecture, leaving the city some square meters greener, but more than that, they are giving the citizens something to reflect upon.